We planned this for ever, and it finally happened. Our intention wasn’t for it to be Valentine’s related, but not that the time is upon us, it seems perfect. 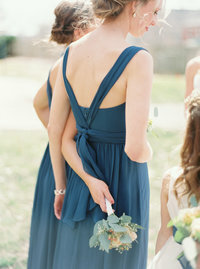 We were lucky enough to have it featured over at Green Wedding Shoes. There were so many elements I LOVED about this shoot. I just love a bride with flowers in her hair, and this version of a head wreath which had flowers on ribbon, was perfect for the her and the flower girls. Not to mention the flower girl dresses from Mini-Boden. 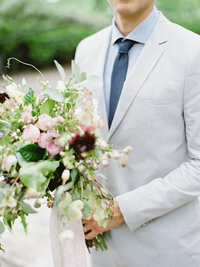 I thought the soft colors that off set the florals worked so well together. I also loved how our hand dyed napkins turned out. The were so easy and had such an effect on the tablescape. Enjoy! Wow Michelle…everything came together so beautifully for this shoot!!! Great job to the whole team!! The way the cake mirrors the paper goods, ahhh the table…and the GORGEOUS couple, and the FLOWERS! !…i’m gushing, but it’s just so beautiful! !